When You Still Have Desktop Intelligence - EV Technologies, Inc. Recently, the Wall Street Journal published an article by personal technology columnist Joanna Stern entitled “How to Send a Fax When You Don’t Have a Fax Machine”. In reviewing “a decades-old technology [that] refuses to die” she writes. This is not a reprint of an article from 1992. (And no, next week I will not be reviewing floppy disks.) It’s 2017 and faxing is still very much a thing. I haven’t seen customers still using BusinessObjects software from 1992 (but it’s theoretically possible – the company was originally founded in 1990). But I have seen Desktop Intelligence. In 2017. It is still very much “a thing”, like faxing. And it begs the question “how will you send a Desktop Intelligence document without Desktop Intelligence”? While the tool has improved over the years, the process hasn’t changed. 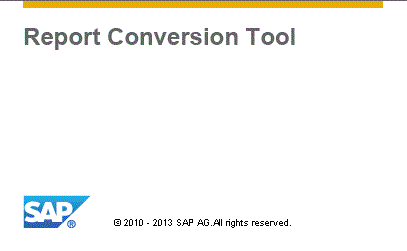 Desktop Intelligence documents should be converted into Web Intelligence using the latest version of the Report Conversion Tool supplied by SAP. Starting with BI 4.0, it’s no longer necessary to move Desktop Intelligence documents into the target environment prior to conversion, although you can continue to do so. In addition, starting with SAP BusinessObjects Enterprise 4.2 SP4, SAP is now providing a tool to help migrated universes from the classic UNV format to the new UNX format. However, we recommend that Desktop Intelligence users take one step at a time during an upgrade project. Retire Desktop Intelligence separately without any scope creep from universe conversion. Then later, you can deal with universe conversion as a separate project. There’s only one option for converting Desktop Intelligence documents. But users have more options in 2017 than they did in 2005 when Desktop Intelligence XI R2 was released. Web Intelligence is still a fantastic business intelligence tool and has received (and will continue to receive) new features to keep it modern. It’s evolved so much that experienced Desktop Intelligence users will require some gap training on the updated user interface and new features exclusive to Web Intelligence. However, you should also encourage your Desktop Intelligence users to take a look at Lumira 2.0, particularly for its data preparation features. And depending on whether your reporting sources are BW-based or universe-based, your users should give the Microsoft Office plug-ins- Analysis and Live Office- a trial run. The best way help users look into the future is to plan a tools discovery day. Set up some workstations in a conference room or auditorium, bring in some coffee and doughnuts, and invite users to an agenda that includes both planned feature demonstrations as well as “alone time” for individual experimentation. Each of these analytics tools have unique capabilities that may or may not appeal to all users. And that’s OK. The important thing is that your user community understands that it has multiple choices in how to accomplish its tasks, all of which have a query panel that’s still familiar after all these years. If you’re still using Desktop Intelligence, there’s no better time than now to plan an upgrade. We’d love to be your trusted partner for your SAP BusinessObjects Enterprise 4.2 upgrade – contact us today and begin the journey into the future.